"Chess offers a lifetime of enjoyment for just a few dollars well spent at the outset". Good advice from Chess Grandmaster Larry Evans on buying chess set. "Make sure the one you buy is easy on the eye, felt based and heavy (weighted). The men should be constructed so they don't fall apart." All sound advice to anyone on the lookout for chess sets for sale, especially if they are looking to buy their very first chess set. There now exists a great variety of chess set types, from the 12th century Isle of Lewis replica sets to the blown glass fantasy abstractions and many theme based sets inspired by history, literature and film, for example, The Battle of Waterloo, Lord of the Rings, Alice in Wonderland, the Simpsons, Harry Potter, Star Trek…the list goes on and if you have a passion beyond the game of chess you will probably find a chess set to indulge yourself. However, these extravagant designs are more often than not better suited as ornaments and objects of art than they are for actually playing chess. 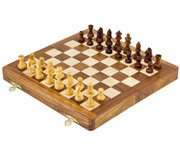 A more conservative and practical choice would be the classic Staunton style chess set. Named after Howard Staunton, a champion English chess player in the nineteenth century, and designed by Nathaniel Cook, the sets first appeared in 1849, manufactures by Jacques of London. Since that time, Staunton has been the reigning choice of so many chess players. As in any classic design the proportions and lines of the original design remain virtually unchanged and unchallenged, apart from a few modernisations to the design, the resulting chess sets for sale being called "Staunton Style". The classic proportions of the original Staunton chess sets, based on the architecture of ancient Greece and Rome have stood the test of time, as has the design of all artefacts build on this solid foundation in the last 200 years. It is the most balanced and pleasing to the eye. As in any classic design the proportions and lines of the original design remain unchallenged by any attempt to add or take away from that original concept. The only allowable variations are size (the proportions remain the same) and the choice of wood to fashion them from. As in all products made from wood, the grain would vary from piece to piece. Staining and lacquering would also be another varying factor. There exists an exceptional set of chess pieces supplied with a superlative hand made cabinet based on the classic Staunton design but with slight modifications, which reflect the Georgian and Roman architecture of the city of Bath in England. It is simply called "The Bath Chess Set" and is admired by all who behold it. Chess is for everyone. Children especially should have access to a chess set and be instructed in the rules of the game. Obviously you don't want to purchase an expensive chess set if it is to survive the rough and tumble of family life or the classroom! 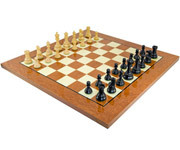 cheap and serviceable chess sets are widely available online; many of them in the Staunton style and made of wood or plastic. It is unlikely that you will find a choice of chess sets on any high street, especially inexpensive ones. But stylish chess sets need not be overly expensive, and with it being a very tactile game, how the pieces feel in your hand, and how stable they are is an important consideration when purchasing a set, especially for the very young. As you might be able to guess from the name, chess sets is what we do best. 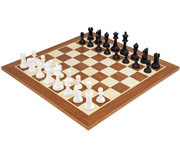 While out entire website is stacked full of chess sets we have put our best sellers in this section for you. 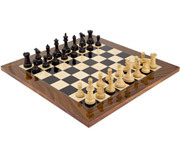 We are one of the UK's biggest stockists of chess boards and chess pieces, we import these from various countries around the globe and combine them together in perfectly matched sets of pieces and board. 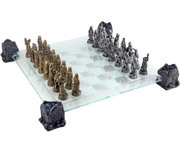 If you are looking for a chess set without the hassle of marrying up the right pieces with the right board then our chess sets section is the best place to look. We are determined to offer you the best possible quality at an almost impossibly low price. 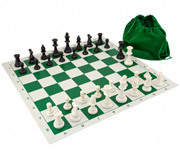 We only source our chess products form suppliers who guarantee the best quality. Our chess boards for example are all sourced from Europe, not the far east, which means the quality is much higher. Our chessmen have all been selected from the worlds finest producers of chess pieces and represent amazing value for money. 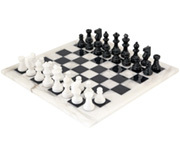 If you want the best deal, but refuse to compromise on quality then our range of chess sets is the only one to consider. The habit of collecting antiques goes back as far as history, beginning with the preservation of temple treasures. In England, concern for historical significance as well as aesthetics of antiques led to the amassing of collections illustrating the national past. As early as the 16th century these collectins were being made. In 1857 the Victoria and Albert Museum opened in London as a repository for decorative arts. In 1882 the Museum of Decorative arts in Paris was opened, and in 1897 the Museum of the Arts of Decoration opened in New York City. The collecting of antiques became a truly popular pursuit of the 20th century. Those seeking antique chess sets for sale create a special niche in eth antique market place. Again this is for aesthetic and historical interest. Any chess set over 100 years old would be considered a genuine antique. So the enthusiasm of the Victorians for saving and collecting means there exists for us today a wide variety of antique chess sets to be mined in this, the 21st century. 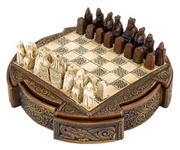 In the 16th century antique chess boards and pieces could be found incorporated in what was known as a games box. The gamesbox contained two double-sided boards which were playing surfaces for chess, backgammon, draughts and mevels, a game of alignment, for which al the various pieces were placed within the box. Today we would call this a games compendium. When not in use all the pieces would be stored in the gamesbox. These renaissance games boxes were ornamental with expensive luxury materials, often veneered in ebony wood with inlays of engraved ivory or bone, the engraved decorations would imitate the designs of contemporary prints, including hunting scenes, sea monsters, birds, dancing couples, monkeys, parrots and lions. One of the finest 13th century carvings I inexistence happens to be a chess piece depicting a king, defended by seven soldiers, surrounded by a castle wall. The walls are decorated with leafy foliage. This type of carving was often used as a display for the skills of artists and craftsmen. They were usually made for wealthy collectors and patrons who would have highly prized the rarity of the material and the exquisite quality of the carving. Just as a chess set would be a prized possession to display I the home, much as a piece of furniture, it was eventually developed into an actual piece of furniture – the chess table. These were more usually ornate, stylish, small tables in which the chessboard becomes an integral part of the table surface. There would be small drawers in the table to contain the chess pieces. Stunning antique chess tables, complete with their original antique chess sets can sometimes be found in dealers' establishments or at auctions. For those of you who would love to have an antique chess set, but are finding one hard to come by within your budget, there is the option to purchase an antiqued chess set. 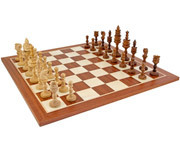 These attractive old style chess sets, most often Staunton chess sets, are cleverly aged to simulate the real thing. 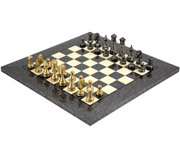 The antiqued chess set is now a growing range with many chess companies.